Pulsar are proud and excited to announce our partnership with Bresser GmbH. Bresser are now exclusive international distributors for Pulsar Observatories. From September 2017 Bresser will handle all non-UK enquiries, sales and support. 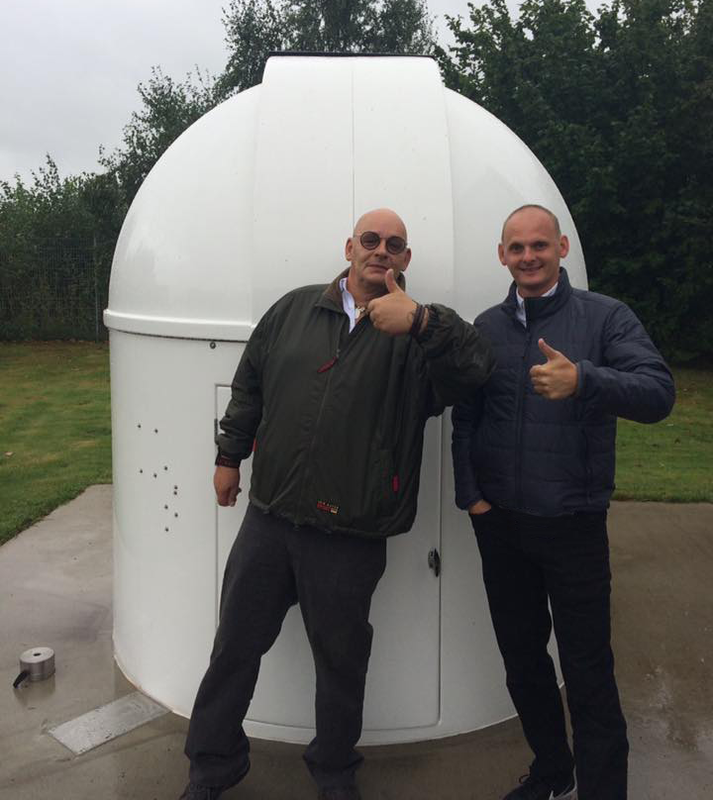 We are really excited to be working with such a well established and successful company who will represent our observatory domes across Europe. More than eye can see -this is what BRESSER stands for. Since almost 60 years we offer telescopes, binoculars, spotting scopes, rifle scopes, night vision devices, microscopes, magnifiers, weather stations and other outdoor products - worldwide. Bresser is a long-established player in this market and is able to operate in black figures since the beginning. This underlines the stability of our company. From 1999 to 2009 Bresser was part of the Meade Instruments Corp. (USA) - the rest of the time Bresser GmbH was owner-operated. Rolf Bresser - son of the founder - main supplier Jinghua Optical & Electronics Co., Ltd. (Guangzhou/China), and CEO Helmut Ebbert (since 2002) are the shareholder of Bresser GmbH. This constellation is state of the art since it comprises development, marketing, and distribution of our products. A long-term business relationship with our customers and employees has priority in our policy and guarantees a high satisfaction for customers, employees and distributors as well. The recently developed distributorships in the Netherlands, France, England, Spain, and the USA already contribute a big part to our transaction volume: 2/3 of our products are distributed outside Germany. With the acquisition of EXPLORE SCIENTIFIC Bresser enforces the direct distribution online. EXPLORE SCIENTIFIC already gains a superb reputation in the astronomy-scene. The ED-APO refractors as well as the wide-angle eyepieces stand for high quality and are held in high esteem. With our experience and state of the art products we are able to offer an excellent customer support. We are always able to find a solution if something does not work with your Bresser product. Many letters if appreciation prove our excellent service. That is why Bresser is capable to offer a minimum guarantee time of 5 years for BRESSER products. No other company in the optical consumer goods industry can claim to be that well positioned like BRESSER. Beginners as well as professionals, younger and older customers - Bresser offers the suitable products for diverse target groups. For that reason our brand concept stands for. Of course, our home brand BRESSER must be highlighted in particular: BRESSER offers the largest product range and the international reputation of this brand consists of high quality, reliability and an excellent price-performance-ratio. BRESSER Junior addresses children and younger future scientists. BRESSER supplies the complete range of commerce: specialists for astronomy, optics, photography, and hunting as well as retailers, toy stores and selected online stores. Since 2012 BRESSER is the licensee of NATIONAL GEOGRAPHIC for optical and outdoor products. Herewith especially pupils, students and outdoor enthusiasts are targeted. NATIONAL GEOGRAPHIC is the brand for our international performance. The NATIONAL GEOGRAPHIC magazine is published in 40 languages - with over 60 million readers. NATIONAL GEOGRAPHIC TV reaches 440 million households in 171 countries and 48 languages. YUKON is the leading brand for Night Vision Devices. With this high quality brand Bresser serves demanding and experienced customers. Our headquarters in Rhede (North Rhine-Westphalia). The 5.000 square meters large warehouse guarantees a fast delivery. Our big show rooms show the complete range of products for our customers. Bresser constantly hosts events for young and old customers to show the product range: experimental rooms for microscopy, 30 meters long night vision tunnel, planetarium to show our night sky at daytime, observatory etc.! With our special dust-free optical laboratory we are able to test the performance and color purity of optical instruments. The computerized telescopes of BRESSER and NATIONAL GEOGRAPHIC are certainly a highlight of our product range. Equipped with a small hand controller, these telescopes easily target celestial objects by pressing a button - automatically! Stars, planets, galaxies, star clusters, and nebulas - not visible with bare eye - will become visible with special wide angle eyepieces. The possibilities of our product assortment is astonishing: You can chose between over 100 variants in optics and mechanics, suited for beginners, hobbyists as well as private or public observatories. For every application the appropriate binoculars: With over 70 binoculars and spotting scopes in 10 categories every field of application is possible for casual observers as well as professionals. Our premium binoculars MONTANA achieve top ratings in prestigious journals. Rangefinders measure distances and velocities. Last but not least: our guarantee periods of 5, 10, or 30 underline our quality standards and commitment towards customer relationship. Seeing in total darkness? Convince yourself in our night vision tunnel! For camping, night-time hiking, hunting or security - our night vision devices are used in all kinds of applications. Bresser is known for high quality microscopes. However, the product diversity of today is vast. Our specialists provide excellent service and meet any customer wishes. The flexibility of our professionals is well recognized by customers in all areas of applications: education, medicine, scientists in industry and at home. BRESSER is also looking for new products that fit to our product range. Our Game Cameras for example react on motion sensors and thus keep an eye on backwoods or gardens. Weather Stations are an inherent part of our product range for a long time as well. Since 2014 BRESSER extends it's product portfolio with Photostudio Equipment. The acquisition of Folux B.V. enables BRESSER to offer a market-proven portfolio of over 1.000 products internationally. © Pulsar Observatories. All Rights Reserved.